Bucks County has long been known as a cultural destination. It has been home to many famous artists of years past like author James A Michener, Moravian Pottery and Tile Works founder Henry Mercer, producer Oscar Hammerstein and Pulitzer Prize-winning author Pearl S. Buck. Maybe there's something in the water. The Delaware River has been a source of inspiration for hundreds of years. This summer the arts will continue with art shows, festivals, and music. A Great Bucks County Tradition, the Tinicum Arts Festival returns to the shady grounds of Tinicum Park on July 7th & 8th, 2018. Gather with friends and neighbors to enjoy the works of over 180 regional artists in the centerpiece Art Barn. Delight in the creations of over 130 artists and craft artisans displayed under the trees. Discover treasures at the White Elephant Tent. Choose from literally thousands of volumes at the Book Wagon. Place a bid at the Silent Auction. Enjoy outstanding live musical entertainment while savoring a fresh-squeezed lemonade, a tasty sandwich or a home-baked dessert in the picnic grove. 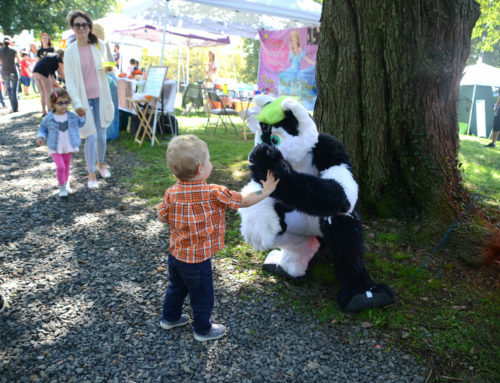 Special activities for children and summer fun for everyone at the Tinicum Arts Festival. Be part of the fun. There are lots of ways to be involved. If you can chair a committee, distribute posters, work several hours at the festival itself, or if you have ideas you would like to share, please call 610-294-9420 and leave a message, or write to the Tinicum Arts Festival, PO Box 106, Erwinna, PA 18920. The Tinicum Arts Festival is the primary fundraiser for the non-profit Tinicum Civic Association. The Festival is planned and run entirely by volunteers. Proceeds are used to maintain the 1832 Stover Mill in Erwinna and to benefit over 30 other non-profit organizations that serve Tinicum Township. The festival returns in 2018 on September 8th and 9th, from 10 a.m. to 5 p.m. each day. On Sunday, The Thompson Bucks County Classic rolls in with six bike races. The event is free to attend, rain or shine. The festival was designed to illuminate the region’s ongoing commitment to arts and culture, the Doylestown Arts Festival annually features 160 juried artists, live music on 5 stages, local food vendors, live art and interactive demonstrations. Founded in 1991 by a small volunteer group of businesses and residents, the festival now celebrates 27 years of showcasing creativity in Bucks County. The highly anticipated two-day street festival attracts thousands of visitors each year. The Festival begins on July 20 through July 29, 2018. Founded by D. F. Whipple, New Hope Film Festival is a cutting-edge and global film festival in the heart of Bucks County, Pennsylvania's riverside art colony, New Hope. The Festival's core mission is to discover and nurture independent filmmakers, many of whom are seeking world and U.S. debuts and remain overlooked and/or underappreciated by other forums. This broad and inclusive group includes filmmakers from outside the United States. The New Hope Film Festival operates by a strict code of fairness: Festival organizers do not invite films into the Festival, offer fee waivers, allow personal pitches from filmmakers, distributors and/or their agents, or sanction any other practices they consider preferential treatment. This highly prestigious, IMDb qualifying Festival is especially renowned for the quality of its lineup, which will be available in June. On Sunday, June 2, 2018, from 5 to 8 p.m. you can tour one of the most beautiful homes and gardens of the Delaware River Towns during the 2018 New Hope Historical Society Garden Tour. This year’s theme is “Silver Jubilee”. Music will be provided by The Straight Ahead Big Band featuring a 23-piece orchestra and Shantel Hubert on vocals. The venue this year is Holmquist Farm at 7043 Phillips Mill Road, New Hope. Tickets can be picked up at the Parry Mansion or online. Tours of the Parry Mansion will also be available from the Historical Society throughout the summer on Saturdays and Sundays, from 1 to 5 p.m. Tours are free and reservations are not required. The Parry Mansion is located at 45 S. Main Street in New Hope. This year's Plein Air Festival and Art Sale will be held on Saturday, June 9. It will feature thirty artists from all over the United States. They will participate in the third annual Bucks County Plein Air Festival from June 4-9, 2018 to produce art from life (as opposed to in the studio). The juried show awards more than $15,000 in prizes and culminates in two signature events, Bucks County Community College's Tyler Tasting Party on June 8 and a public festival on June 9. The organizing committee extends its deep appreciation to the artists, art patrons, hosts and sponsors, and countless volunteers who allow us to welcome some of the country's most accomplished artists to vibrant and historic Bucks County. For ten Saturdays in the summer the heart of Yardley’s downtown will be the place for free outdoor music. The season begins on June 2 and goes through August 11 from 6 to 8 p.m.
Shows are family friendly and participants are invited to walk, bike, drive, and dance their way over to Music on Main and to bring a folding chair or blanket. If you are driving into town, we recommend parking in the Keller-Williams and Borough Hall lots off of Canal/S. Main Streets, the spaces on Canal St. next to E. College, the spaces on-street on W. College or the spaces on-street at Penn Valley and W. Afton. Every week this summer, the stars of Hollywood’s Golden Age return to the silver screen: James Dean, Jimmy Stewart, Audrey Hepburn, Ingrid Bergman, Humphrey Bogart, Paul Newman…the list goes on and on. Memorable acting in great films. See these Hollywood classics the way they were intended to be seen: on the big screen in a packed auditorium. Reduced admission for young patrons. Most of these Hollywood Classics are good for any age audience – and each film of the entire Classics series is only $3 for patrons 18 years old or younger. And, dress “in the theme” of the movie – you get a free popcorn. Unforgettable brings you the best songs from pop culture, musicals, and movies. You’ll hear songs like “Night & Day”, “Summertime”, and “The Pink Panther Theme”. Time in A Bottle has all your favorite songs from the 60s and 70s to transport you back in time. You’ll hear songs such as “Just the Way You Are”, “Let It Be”, and “The Way We Were”. Broadway Summer Spectacular brings Broadway to Bristol in one sensational concert. It’ll be an evening packed with Broadway hits from composers like Andrew Lloyd Webber, Jerry Herman, and Leonard Bernstein. The annual Polish Festival will take place on Labor Day Weekend, September 1, 2, and 3 and on September 8 and 9. This annual event will include music, dancing historical reenactors. There will also be midway rides and games. There will be delicious Polish and American Food on order, such as Pierogi, potato placki, Grilled Kielbasa, Golabki, hot dogs, chicken, Polish Ice, funnel cakes and Polish fries. The new exhibit, The Call of the Tranquility: An Expression of Traditional Chinese Brush Painting, featuring the work of Huangxin (Derek) Wang, Chenlin Cai, Lijun Tian, and Jennifer Yuan, will run from June 11, 2018 through January 2019 at the Exhibit Gallery of Pearl S. Buck International in Hilltown, Bucks County, PA. The exhibit displays the work of four contemporary artists who continue the ancient tradition of Chinese brush painting, a unique art form that has developed over 6,000 years. Chinese brush painting had a profound influence on the development of art in East Asia. In the 15th century, Chinese painting branched off a style, called scholastic abstraction, that was considered avant-garde. Traditionally, Chinese painting used ink, colors and brushes on rice paper. Today, Chinese painting sustains its vitality through the transformation of art ideals and new media.